I’ve got a theory as to why we suddenly have back-to-back streaks – and it involves my mom. Some of you might recall that after Vaughn Winchell’s first game, my mom (and Kermit, the pug mix) joined me to discuss the Streaks of Futility: nearly 5 weeks without a three-time champ, and almost 20 weeks without a five-timer. Lo and behold, she mentioned the name of the person who laid the curse: Julia Collins. Vaughn went on to break that curse, winning his fifth game on New Year’s Day. Tonight, his successor, Elliot Yates, tries to match that streak. He’ll need to catch a break, because he has less than 2/3 of John’s total. Elizabeth has less than the difference between John and Elliot, so she’s out, but might have a shot at second – we’ll look at that, too. If Elliot doubles his score, he’ll have 26,400. John will need to wager 5,800. 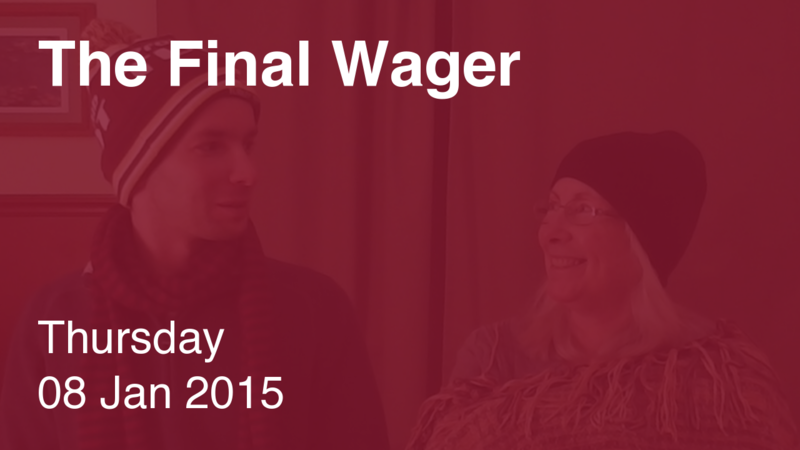 An incorrect response with that wager will leave John with 14,800. To get above his total, Elliot must wager at least 1,600, but might as well go all-in. If I’m Elizabeth, I look at what Elliot needs to wager to cover a zero by John. The difference between them is 7,400; if Elliot goes for the cover and misses, I’ll need to wager 1,800 to beat him. 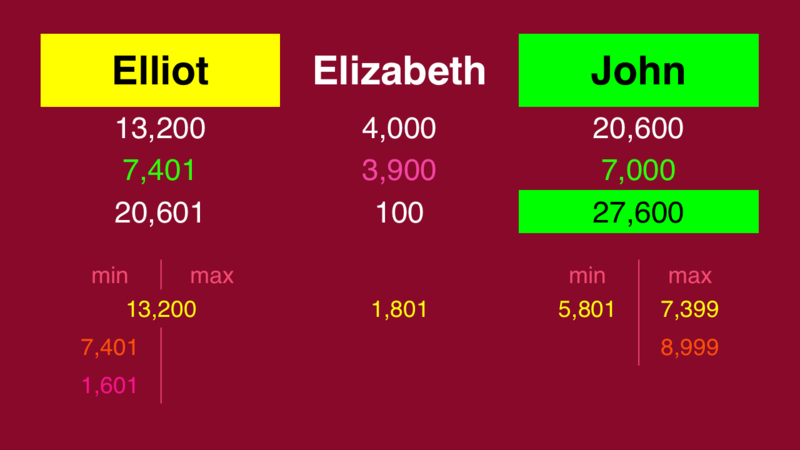 That difference is also John‘s maximum, but if he’s feeling good about the category, he can go for even more: 9,000 (which assumes Elliot makes the bare-minimum rational wager of 1,600). A double-get and no need to go three levels deep – tonight, anyway. We’ll see if John outflanks the competition in tomorrow’s game. Also, I wonder how many Geritol Complete users were scratching their heads over this Final. New Fact Primer heading your way tomorrow! Bundle up, because we’re heading out into the cold. In the last 10 games (counting tonight) in which we had three players in Final Jeopardy we have the following result: In 3 cases all three got it right = easy. 3 cases of 1 right + 4 cases of 2 right = 7 ok and 0 cases of 0 right = hard. So that’s a “final jeopardy degree of difficulty = just right” score of 70%. Just so you know, I live in Seattle. It’s not as cold as NYC or Vermont. But it’s cold. Speaking of cold, it’s been a while since we had a triple stumper on FJ. Finally, I am adding an “average degree of difficulty” calculation. What’s the average number of correct FJ answers over the last 10 3 finalist games. The average degree of difficulty is currently 2.0 meaning, on average, exactly two people answered correctly on FJ.